This list has been a great success this year, after creating our original list we have added new ideas and added a few words when we have ticked the items off. I like our activities, there is a mix of trips out but also some simple, free activities to do too and on the dull days we’ve had its definitely added some inspiration to our day. Here’s our update, 3 weeks into the Summer holidays. Go horse riding – must book this! Initially this was Little Miss’ choice but now Little Man wants a go too. J Play putting – this was a family treat on a gorgeous Sunday afternoon. Mr S’ golf skills shone through but we all found it fun. Go to Grandma and Granfer’s – this is quite difficult to plan as they are moving but still don’t have contract dates. Hopefully after our holiday we’ll have definite dates to plan our visit. Find Shaun the Sheep in Bristol – I am so looking forward to this but it will be done on the above visit. I’ve seen lots of tweets about the trail and am very keen to follow. J Play on the beach – whilst we’ve not had the best weather we’ve been on the beach as soon as the sun has shone, we’re hoping for more sunny days on the beach. J Go to the farm– This is a local farm and outdoor play area, the children loved their day here. It’s a place they have always loved and we have many photos from over the years. It was brilliant but it was bitter sweet, they are getting to an age where they are growing out of the attraction and it may be one of our final visits. Do a bike ride – this sounds so simple but we need to teach Little Man to ride his bike first. We have been out lots, nearly every dry day and progress is being made. Do the library reading challenge – we’re working through the books for this challenge, 4 read and 2 to go. Get the paddling pool out – there’s not been too many sunny days and we’ve headed to the beach on these days, hopefully we’ll get a few more bright and hot days. Make real lemonade – not quite sure how this got on the list, but there is a recipe in my magazine this month. A make for after our holiday. J Discover dinosaurs – this was a brilliant afternoon last Thursday at a local country park led by a highly enthusiastic and passionate guide. We did some crafts but handled real fossils, dug for fossils in the sand and made dino footprints. Watch Inside Out at the cinema – I’m really keen to see this film, it looks amazing! 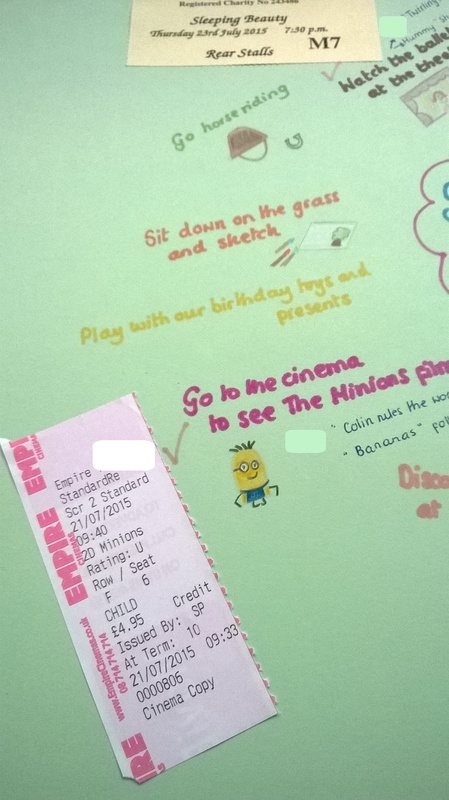 J Watch the Minions at the cinema – this was the first thing ticked off the list when Mr S took the children to the cinema when I was still at work in the first days of their holiday. They loved it! J Play with our birthday presents and toys – with the rough weather we’ve done lots of crafts and playing inside so another ticked off. Sit down on the grass and sketch – another one to do, we’ve some new pastels so they should make for nice pictures. Do messy play, play with gloop. That’s 7 completed with others in progress and a few to complete after our holiday to Spain. I’m hopeful it’ll be a full list done by the start of the new school year.